Kim Kushner is probably the nicest person I have ever met in my entire life. Like ever! Granted I'm from Brooklyn, so niceness is not something you actually expect to see every day, but with Kim, your getting the real deal. 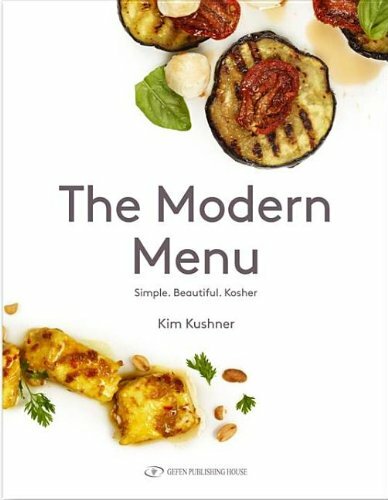 Kim's first cookbook The Modern Menu, came out when I was still beginning to get into cooking. I can't say that I have fallen for every cookbook I've ever read. With some cookbooks, the format is not to my liking or there aren't enough pictures, with others, the recipes fail to impress, and with others, everything is so crazy complicated or unnecessary I get frustrated and I'm like, "WHY???". Kim's cookbook was like an oasis in a desert, but the great kind, not the one that isn't really there. The pictures were clean and beautiful, displaying the food in interesting ways, with lots of color in a way that caught the eye. Her anecdotes for each recipe were sweet, thoughtful, and didn't go on forever. Her recipes were simple, with a small list of ingredients for each dish (always appreciated). Kim used very clear, uncomplicated and thought out instructions for each recipe which made even complicated steps, easy. The flavors were new, interesting, bold and exciting to try! At first, the ingredaints seemed unfamiliar and strange and I thought I wouldn't be able to find them. Finding them was actually surprisingly easy, and after tasting each one I had no trouble experimenting with the leftover ingrediants in my day-to-day dishes. Before reading her book I never thought about using miso, or mirin. Now they are staples in my pantry! I was surprised to see that salt and pepper wasn't an automatic addition to every savory dish and sugar wasn't added to every sweet one. At first, I was skeptical about how so few items could create something spectacular. I soon found out. Once I tried the recipes I was pleased to find that not only did I enjoy what I made, but I also did not feel the need to adjust the recipe to my liking at all. This, for me, is a huge deal! The recipes you find inside her cookbook are not heimish (Old Jewish flavor), so if you are looking for familiar tastes this cookbook isn't for you. They are, however, interesting, unexpected, easy and fun. If you are looking for something new to add to your weekly menu, or an impressive salad to bring to a simcha (celebratory gathering), or even a perfect biscotti (because Kim is the Biscotti Queen!) this cookbook is definitely worth your time! I've found people never believe you if you only say good about something, or maybe that's only in Brooklyn, but to help you believe me I'll tell you what I didn't like about the book. The recipes are creatively divided into mini menus like "Fresh", "Saucy", or "Crisp" instead of Poultry, Salads, and Dessert. Though I do appreciate the creativity, I found it hard to navigate through the cookbook and find my favorite recipes again. Lucky for me, the index in the back has helped me find my favorite recipes in a flash, so it's really not that big of a deal. When I first began to entertain the thought of starting a cookbook, Kim was the first person I was in contact with. Her book left me thoroughly impressed and I wanted to know what it would take to pursue a similar venture. Kim responded right away, because she really is the nicest person ever, and explained some of the steps she took over the five year process. She also offered her support and help, which was the nicest thing, considering she didn't know me from Adam. About a year later, I commented on a photo of Kim's saying how amazing it would be to meet her. A few moments later, I received an email from Kim with an idea for a potluck dinner with other Kosher Food Bloggers and that is how the Kosher Foodie Potluck was born! Kim artfully and seemingly effortlessly arranged a beautiful evening on an NYC rooftop where Kosher Food Bloggers from all walks of life came together, had a wonderful meal, and shared support and stories. It was a great experience to learn from everyone and meet the faces behind the amazing posts and blogs we see. Kim just announced that she signed a deal with a publisher for a new cookbook. I don't know about you, but I cannot wait until it comes out! In a large bowl, combine the cabbage, pomegranate seeds, cashews, cilantro, and poppy seeds. Pour half the dressing over and toss to thoroughly coat, adding more if necessary. Garnish with cilantro sprigs and serve. In a medium bowl, whisk together the brown sugar, miso, vinegar, miring, and soy sauce. Place the cutlets in a resealable bag and pour HALF the marinade over them. seal the bag and marinate the chicken for at least 30 minutes, or up to 12 hours in the refrigerator. Cover and refrigerate the remaining marinade. Preheat the oven to 150 degrees. arrange a few layers of paper towels on a large plate or platter. Place the panko crumbs on a large dinner plate. Season the breadcrumbs to your liking, if desired. Heat the vegetable oil in a large frying pam over medium-high heat. Remove the cutlets from the marinade and dredge in the panko crumbs, coating both sides evenly. (Discard the chicken marinade and the plastic bag). When the oil is hot but not smoking, slip 2 cutlets into the pan and cook until dark golden and crisp, about 2-3 minutes per side. Transfer to the paper-towel lined platter with a slotted spatula to drain. Repeat with remaining cutlets. Transfer the cutlets to a baking sheet to keep warm while the remaining batches are cooking. Drizzle the reserved marinade over the chicken just before serving or serve alongside the cutlets.